The VA Home Loan program is a government insured loan program for borrowers who have served our country in any of the branches of our Armed Services. Borrowers take advantage of 0% down and low interest rates while using your VA loan to purchase you next home in San Diego. In order to use a VA Loan on a Condominium or Townhome, the Home Owners Association (HOA) must be VA approved. DETACHED SINGLE FAMILY HOMES ARE ALREADY VA APPROVED! Click here to search for detached single family homes. If you are looking for a condo, we have made it easy to search for VA approved condominiums for sale in San Diego. If you are looking for a single family home, please use the search at the top of the page as detached homes do not need to be VA approved. 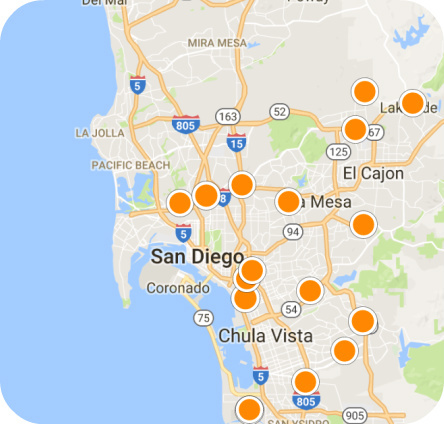 Click the links below to access the most up to date list of all the VA approved condos and town homes for sale throughout San Diego County. SAN DIEGO CENTRAL VA CONDOS: Talmage/San Diego Central, North Park, Mission Hills, East San Diego, Golden Hill, Linda Vista, Encanto, Lemon Grove, Logan Heights, Normal Heights, Paradise Hills. SAN DIEGO COASTAL VA CONDOS: Clairemont/Bay Park, Coronado, Downtown, La Jolla, Mission Valley, Ocean Beach, Old Town, Pacific Beach, Mission Beach, Point Loma, Sorrento Valley, University City/UTC.